A day barely goes by without hearing about Russia on the news. Often you see an interview with a Russian official – do you understand what they’re saying without the subtitles/translation? If you don’t, no problem. You’re in good company. After all, some people consider Russian to be one of the most difficult languages to learn (from the perspective of a native English speaker). There are also fewer tools available for Russian than for learning Spanish, as an example. But don’t fear. To make it easier for you, here are the tools I have used to successfully learn Russian, together with others from people who credit much of their fluency in Russian to a specific site or course. Let’s start with the alphabet! Russianforeveryone is a great resource for learning the alphabet. It lists all 33 letters of the alphabet and you can click every letter to hear the correct pronunciation. It also gives some example words, so you know how to recognize every letter ‘in the wild’. Katie is a fan of Michel Thomas for language learning. And I completely agree with her. It’s a good program to get the basics down. In the beginner course for Russian, the last lesson is dedicated to the learning the alphabet. You listen to the audio while looking at a cheat sheet of the alphabet. And the teacher guides you through the entire alphabet in about an hour, including many examples phrases. Russian for Everyone is a great site for learning the Russian alphabet. It also gives some example words to help you recognise the words “in the wild”. Next day you get new phrases, but also the phrases from the day(s) before. After a specific amount of repetitions, you’ll know a phrase by heart, and it will no longer be repeated. I do not recommend using only Glossika, since there is zero grammar explanation, but it works wonders for learning new complete ready-to-use sentences (even if you’re a complete beginner). Chances are you’ll stumble over Russian pronunciation. The best tip here is to give it time and listen to a lot of spoken Russian. Your brain is smart and will get better day by day. But if you want to skyrocket your pronunciation, check out these 10 tips for improving your spoken Russian. 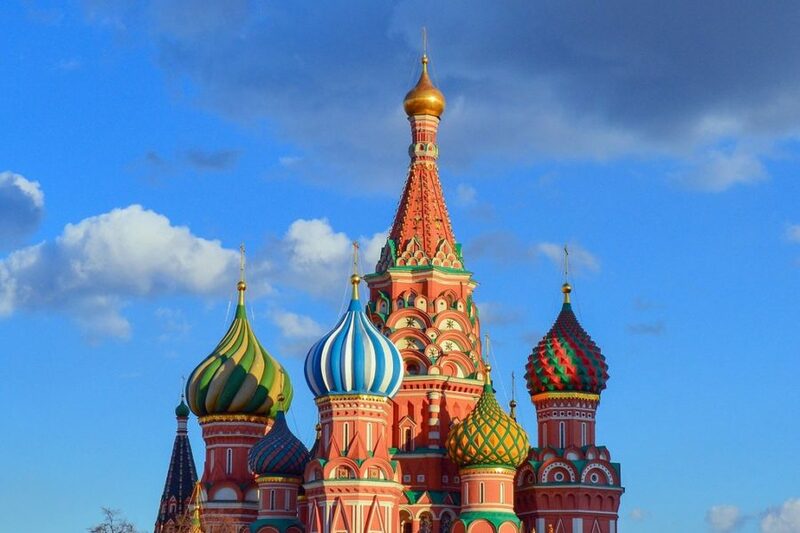 Memrise is another great (free) app that you can use to learn how to speak Russian. I highly recommend you install it on your phone. This is a great way to practice whenever you have a couple of free minutes (be sure to bring you headphones though if you’re out in public!). It uses gamification to teach you the alphabet in the beginning and soon after you’ll learn useful common phrases. 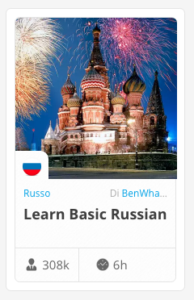 Best use of Memrise: If you’re unsure whether you want to pursue learning Russian long-term, Memrise is a great way to try it out for a while and see if you like it enough to continue with a (paid) course. Memrise is a great way to practice Russian on your phone whenever you have a couple of free minutes. Russian grammar is daunting with all its cases and conjugations. Just when you think you’re doing alright, it comes with a new concept that makes you feel like a complete beginner again. Here are some tools that will help you get better at Russian grammar. 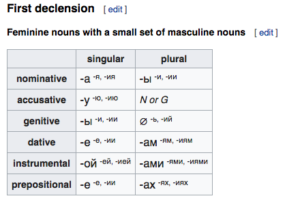 Yes, Wikipedia is one of my go-to places for learning Russian. You’ll love this page, especially when you get to the case system (Russian words change their endings in 6 different ways depending on their function in the sentence). It has every possible case ending clearly laid out in tables. Plus there is a good amount of explanation. But be warned: don’t go here first thing in your studies. Be sure to have a base where you know the alphabet and some Russian phrases. Ideally, you’d use it a review sheet while doing another course. Wikipedia has every possible Russian case ending clearly laid out in tables. Masterrussian is one of the oldest sites about learning Russian. And their grammar section is incredible. They have a large database with all sorts of subjects. And you can use that to slowly increase your knowledge of Russian grammar. On Russian-blog, you’ll find tons of modern lessons about Russian grammar. The owner Irina has done her best to teach you Russian grammar from complete beginner to advanced. Check it out and do a lesson a day for maximum effectiveness. On Italki you can hire a native Russian teacher to give you a Russian lesson over Skype. It’s a good system and you can compare different teachers based on rating and their personal description of their teaching style. I recommend you schedule a (bi-)weekly lesson to practice your Russian. This way you can see clearly if/how well you’re progressing. Another language teaching platform that works the same way as Italki. But I’ve found that the quality of the teachers is a bit higher on average. So are the prices, which means that it depends on your budget which platform is the better choice for you. Russianpod101 is my favorite course. It takes you from complete beginner to intermediate speaker. Their lessons cover every important aspect of learning Russian (vocabulary, grammar, common phrases, speaking, listening – and even culture). If you want to learn more, check out my review of Russianpod101 here. Or go straight to their site and read some tips on how to use their program for maximal effectiveness. Pimsleur is another excellent choice if you want to learn Russian. It’s an audio course that will teach you the basics of the language. One common complaint people have about the course is that it’s a bit slow at times. But some people actually do better with more repetition and a slower pace. So if you like to take things a little slower at first, then Pimsleur can be an excellent option. This is the second time Michel Thomas appears on the list. Apart from being a great option (the beginner series) for learning the alphabet, MT is also a good option on the whole. I especially like the Michel Thomas teaching method as it puts the responsibility of learning on the teacher – not on you. So as long as you listen (and repeat) with focus, you’ll blast through the beginning stages of Russian fluency. Check out the Youtube channel StarMediaEN. It features a lot (hundreds) of Russian series and movies. Including subtitles. Which is perfect if you’re starting out. If you’re a complete beginner, listen to Russian audio with English subs. Once your Russian gets better, try it with Russian subs. And you’ll know you’re good if you understand it without any subtitles whatsoever. Here’s Katie’s advice on how to learn a language by watching TV and movies. You’re probably listening to English music (or in your own native language). Why not take that time and use it for your Russian studies while keeping it fun? For example, listen to a Russian music mix while working out. You’ll get a great sense of accomplishment once you can identify lyrics in songs, which will motivate you to continue learning. You can start by checking out a few Russian playlists in Spotify. Many people think Russian is a difficult language to learn. With the right tools, however, you can make a lot of progress in a relatively short period of time. These were my 15 tools that I used a lot for learning Russian. I hope that you will get just as much out of them as I got!